Update: Following a coup attempt Friday in Turkey, the elected Turkish government has regained control as of Saturday morning. The New York Times reported that 2,839 military personnel have been detained and the most recent death toll stands at 265, which includes 104 coup supporters and 161 civilians and police officers. Turkish President Recep Tayyip Erdogan sent a mass text message to citizens on Saturday calling for them to "stand up" for democracy. Earlier: On Friday afternoon, normally a quiet time for news, people around the world suddenly started asking: What is going on in Turkey? It’s not yet entirely clear, but according to a flurry of reports, elements of the Turkish military have attempted a coup against the country’s leadership. Both the existing government and the military claim to be in charge, and there are reports of violence across the country. Here's what we know. On Friday afternoon, footage surfaced on social media that reportedly depicted a military jet flying very low to the ground in Ankara, the nation’s capital. Not long thereafter, Turkish Prime Minister Binali Yildirim said in a television address that a coup attempt was underway by some unspecified segment of the Turkish military. He said that the overthrow would not be successful. The military said the opposite, and released a statement asserting that it had indeed taken control of the country and that it was imposing martial law. The BBC reported that tanks were blocking the roads to Istanbul international airport, and that all flights had been grounded. According to RT, the military took control of state-run television in Turkey, and the Guardian reported that access to Twitter, YouTube and Facebook was blocked on Friday shortly after the apparent coup attempt. Turkish President Recep Erdogan was on vacation on Friday, but he addressed the nation over FaceTime and said that he’s still in control, and that the coup plotters will be punished. He urged supporters to take to the streets and show support for the country's existing government. NBC reported earlier in the day that Erdogan's plane was refused landing rights at the Istanbul airport. Hours later, though, Turkish officials said that Erdogan's plane was landing in Istanbul, and AP reported that large crowds of supporters gathered at the airport to greet Erdogan. There have been reports of violence in the country. According to AP, the Turkish parliamentary building was hit by a bomb; it had been reported earlier by Reuters that a tank open-fired on that same building. A witness told Reuters that a military helicopter opened fire above the streets of Ankara, and some time thereafter, the Turkish news agency NTV reported that a fighter jet shot down a helicopter over the same city. Yildrim says that a no-fly zone is in effect over Turkey, and that "any aircraft will be shot down from the ground." One big thing that remains unclear: who is leading the coup, and how much of the country's military is in on it. A "senior EU source" told Reuters that more than "just a few colonels" are involved, and predicted that the coup would succeed in toppling Erdogan's government. 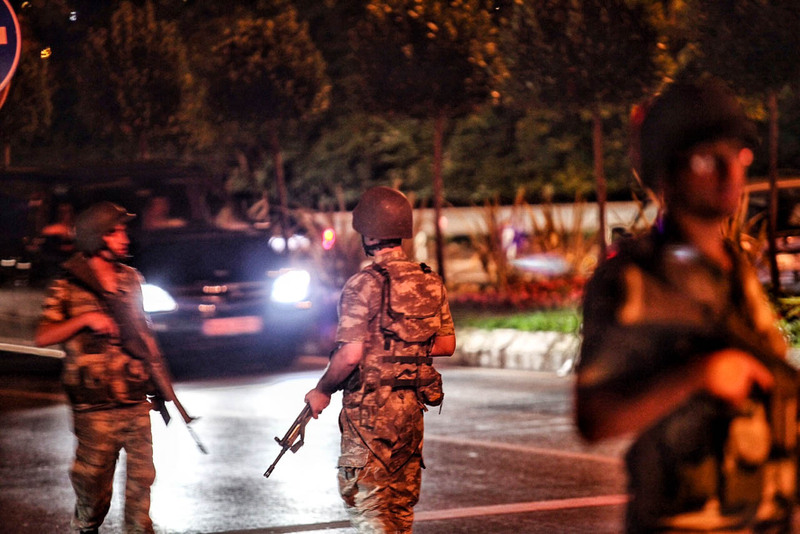 Reuters reported later in the day that around 30 soldiers who were part of the coup attempt surrendered, and handed their weapons over to police. It's unclear how many people in total were participating in the coup. President Obama said in a statement that he was in communication with Secretary of State John Kerry, and that "all parties in Turkey should support the democratically-elected Government of Turkey."